The soil of American popular music has long been watered by black gospel, which in turn was watered by the work songs and spirituals of the slavery days, and those songs were built on the rhythms and instruments of West Africa. At some point it all met the melodic structure of European folk music and the theatrical sass of Tin Pan Alley, often flattening into the minor key of international lamentation, and created a garden gumbo that was all the better for its multiple and serendipitously clashing flavors: a brash, free-flowing, restlessly transforming American stew. Ethel Waters stirred the pot. To people who came of age in the 1960s and ’70s, Waters was a figure of elderly power and spirituality, famous as a gospel singer, particularly in the Billy Graham Crusades, and iconically for her rendition of the spiritual His Eye Is on the Sparrow, which she had famously performed in the early 1950s Broadway and movie adaptations of Carson McCullers’ novel The Member of the Wedding. For people of their parents’ and grandparents’ generations, Waters was something altogether feistier and more glamorous: before she joined the sacred industry of saving souls she was one of the biggest names in show business, a pioneering black star of Broadway and the movies, a recording artist whose jumpy, elegant, playful, and sometimes heart-shattering voice spanned the worlds of the blues, jazz, vaudeville, musical theater, swing, and, yes, occasionally gospel. It’s that budding and scrapping star of an Ethel Waters we meet, for the most part, in the musical biography His Eye Is on the Sparrow, which opened Friday night in the intimate Ellyn Bye Studio at Portland Center Stage in a production featuring the powerful and brooding Maiesha McQueen as Waters and – off to the side but of utmost importance – Darius Smith at an upright piano as her accompanist and musical provocateur. The character of Waters, in the play that Larry Parr writes and McQueen interprets with relentless fervor and flashes of sharp dark wit, was created from the extreme poverty of her upbringing and her acute understanding of the crude and seemingly intractable racism that drove almost everything about the culture she lived in. That such forces, softened in the years since her death in 1977 but never eliminated, has been regaining its strength and virulence lends contemporary force to a story that told differently might seem like simply an enjoyable slice of musical nostalgia. Indeed, when we meet her in the person of McQueen in His Eye Is on the Sparrow she is the older Waters, gray-haired and clutching a large Bible as she sits on an overstuffed couch and begins to reminisce. 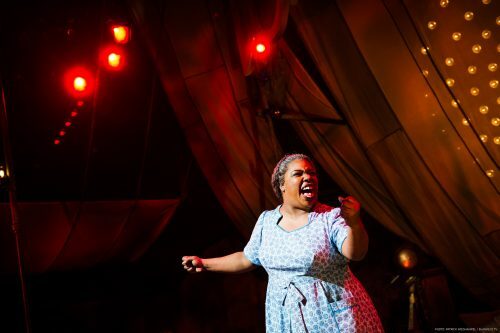 McQueen, who last starred at Center Stage in the company’s brilliant 2015 Ain’t Misbehavin’, is stylistically a different sort of singer from Waters, with a huskier and more deeply blues-driven voice. But mimickry isn’t the point, and McQueen is often quite glorious in her renditions of songs that Waters claimed as her own, from the comic novelty tune Masculine Women, Feminine Men (an intriguing choice, given that Waters is purported to have had both male and female lovers, a point the play does not address) to a rootin’-tootin’ Frankie and Johnny Were Lovers to sizzlers including Sweet Georgia Brown, This Joint Is Jumpin’, Am I Blue?, Stormy Weather, Heatwave, and the heartbreaking/chilling Black and Blue. The songs are mostly from the 1920s and ’30s (the most recent are Taking a Chance on Love and Cabin in the Sky, both from 1940) and this is where the production truly shines, in McQueen and Smith’s renditions of a kind of effervescent and sophisticated American popular song that is now history and yet seems unlikely ever to fade away. Writer Parr’s transition to Waters’ late-career switch to gospel is patchy, maybe because it was patchy and difficult to explain in real life, too. Popular music is filled with people who began in gospel and then crossed over: Sam Cooke, Lou Rawls, Aretha Franklin, Fontella Bass. And it’s had its gospel stars who drew pop-sized crowds and adulation: Sister Rosetta Tharpe, the Five Blind Boys of Mississippi and their friendly rivals the Five Blind Boys of Alabama, Marion Williams, Mahalia Jackson. The late Portland singer Willa Dorsey, who traveled the world as a gospel singer and was a second cousin of the legendary gospel songwriter Thomas A. Dorsey, also was a regular in the Billy Graham Crusades. Waters’ journey was in reverse, traveling from popular stardom to gospel stardom, at least partly as a way to revive a flagging career. 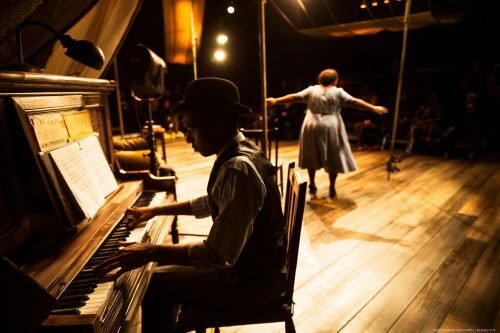 I’d like to think, as the play intimates, that the journey was also toward a measure of peace and joy. Parr suggests that she ultimately opened up to Graham because she felt he was an unprejudiced man and used his influence in the cause of racial equality and open opportunity. However it came about, it was a mutually beneficial partnership. As a fervent believer in religious freedom and also in the necessity of a separation of church and state it has always bothered me that Graham moved so smoothly along the avenues of power, popping up regularly in the company of presidents. His more politically right-wing evangelist son Franklin’s cozying up to the divisively partisan Trump administration bothers me more, particularly since this administration seems to stand so foursquare against the openness that Billy Graham reportedly embraced. Yet the sins of the son are not necessarily the sins of the father. Waters embraced the senior Graham in turn, and video clips of her performances at his crusades suggest a performer comfortable and happy in the role. That’s part of the American stew, too. His Eye Is on the Sparrow continues through March 19 in the Ellyn Bye Studio at Portland Center Stage. Ticket and schedule information here.